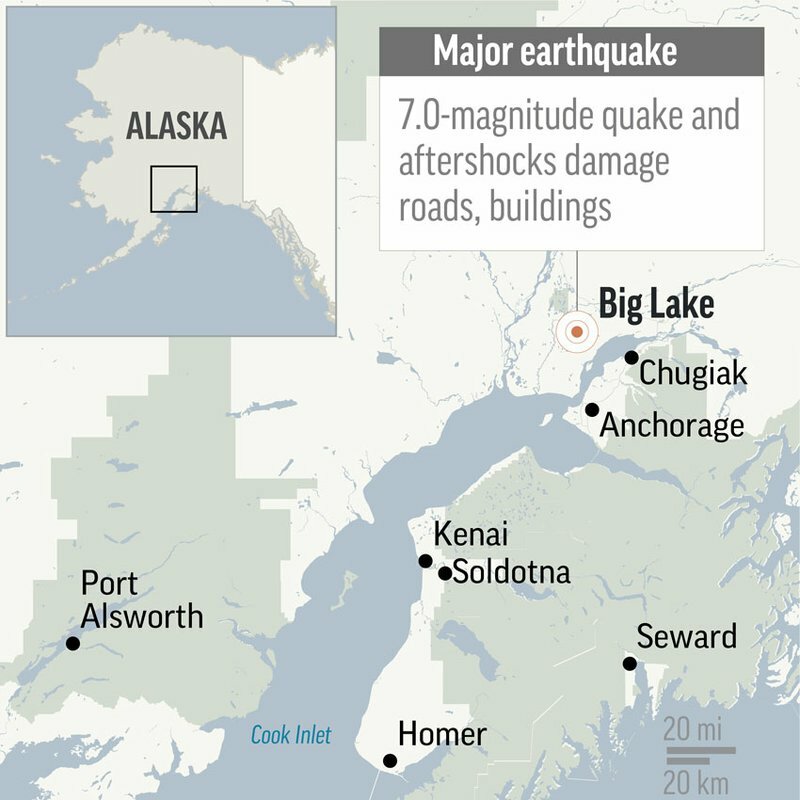 The U.S. Geological Survey said the first and more powerful quake was centered about 7 miles north of Anchorage, Alaska’s largest city, with a population of about 300,000. People ran from their offices or took cover under desks. The 5.7 aftershock arrived within minutes, followed by a series of smaller quakes. Anchorage Police Chief Justin Doll said he had been told that parts of Glenn Highway, a scenic route that runs northeast out of the city past farms, mountains and glaciers, had “completely disappeared.” Traffic in the three lanes heading out of the city was bumper-to-bumper and all but stopped Friday afternoon as emergency vehicles passed on the shoulder. Graphic shows epicenter of Alaska earthquake and aftershocks. Gov. Bill Walker issued a disaster declaration. He was in an elevator in a high-rise Anchorage office building and said it was a “rough ride” coming down. He described the quake as a 7.2, though it was unclear why his figure differed from that of the USGS.